Upon awakening this morning and taking the dogs out for a walk here in Winter Park, Florida, I realized the “chill” in the air. I use the word, “chill,” loosely when I speak of October weather in Florida. I was quickly reminded that Florida seasons may not be in the trees, but Florida seasons are definitely in the skies. 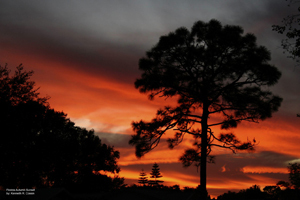 The sun moves further north, the cloud patterns change from the high cumulus summer rain clouds to the wispy stratus type that reflect and disburse the Florida sunlight into an illumination sensation. So, next time you are driving, walking, or simply enjoying the outdoors, remember to look up at the sky. It’s guaranteed to marvel.